How To Build Your Own Custom iPhone 7 With 3.5 mm Headphone Jack With What a Man Used. Someone had just build iPhone 7 with 3.5 mm headphone jack entirely from spare parts. Well, the Youtuber Scotty Allen bought all the required spare parts from Chinese marketplaces. He claims that to do so he purchased three iPhone 7, multiple screens, back covers, logic boards and other components. One of the biggest changes that the iPhone 7 brought was the exclusive use of the lightning port, having abandoned the 3.5mm jack. Most understood this move from the tech giant Apple, but many still question this decision and preferred to keep in mind this audio interface, which they were accustomed to use. To prove that after all the iPhone 7 may even have a jack of 3.5mm jack, a well-known YouTuber got to work and managed to do so. In fact, this iPhone may have a jack of 3.5mm. 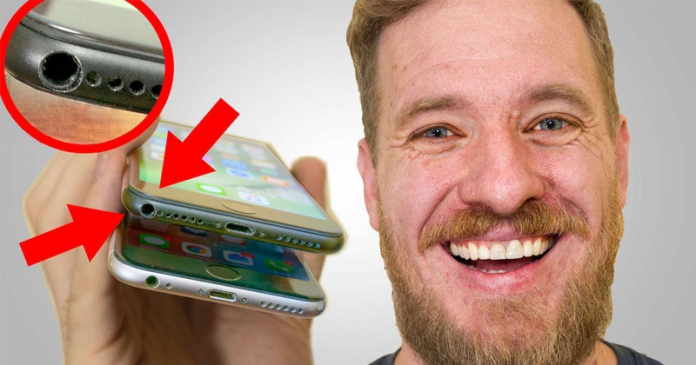 It was well-known Scotty Allen, from the channel Strange Parts of YouTube, who took the task to be able to convert an iPhone 7 and to equip it with a jack of 3.5mm. His previous prowess was to be able to mount an iPhone 6s only with parts bought in the stores of Shenzhen, China. This time the project was much more complicated because it required the placement of new components in a very small space. The project eventually took 17 weeks and led Scotty Allen to buy 3 iPhone 7, multiple screens, back covers, logic boards and other components. He also bought several lightning adapters to choose the one that suited best and that would fit the little space that could find within the iPhone. There were many tests that he did without achieving practical results, but in the end, he was able to fulfill the task. To make use of two particularities of this iPhone. How was it possible to make the change? First, and contrary to what the tech giant Apple claims, there is room for analogue audio input on the iPhone. It is occupied by a piece of plastic, which the tech giant Apple calls a barometric respirator. To gain even more millimeters of space, he had to move the battery and Taptic Engine. The second is simpler and has been known since the introduction of the iPhone 7. Even though it does not have a traditional audio port, the tech giant Apple offers a 3.5-jack to the lightning converter. It was this component that Scotty Allen managed to put inside the iPhone 7 to make the new audio port available. Of course, the connection between the adapter and the audio port had to be made, having traveled to printed but malleable circuits. Only in this way it was possible to make this connection. Even with all this work, the solution has some problems. The most serious of them is that it is not possible to use the lightning port and the 3.5 jack at the same time. This is a limitation of how it was created and needed a better knowledge of lightning to be functional. Despite these limitations, the work that Scotty Allen has accomplished is exceptional and shows that, as many have said, the iPhone 7 could have kept the 3.5 jack as many have asked. All information regarding this project is public and anyone can repeat the feat.